Recently the ADF SIG at AMIS organized an ADF DVT Speed Date. During this speed date six AMIS consultants presented their favorite DVT Component. In a series of blogposts we share the knowledge and findings. 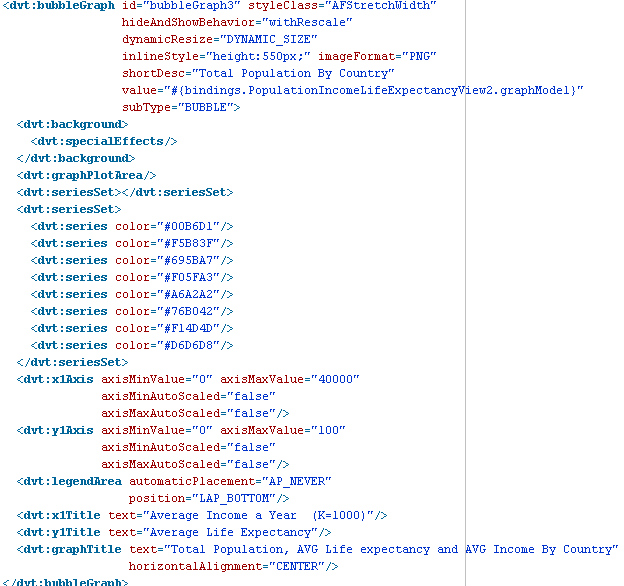 In this post you get introduced to the ADF DVT bubble graph. I will also show you how to make it interactive by clicking on the bubbles. 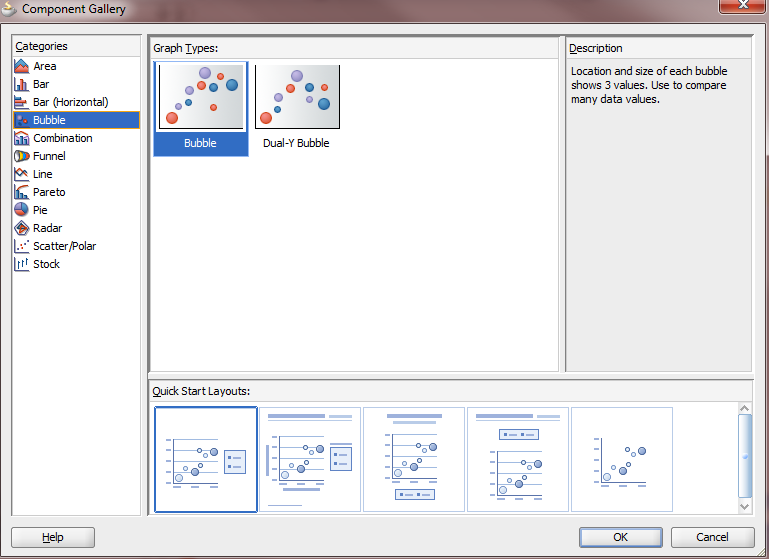 The ability to make a graph interactive can be very usefull. In the following bubble graph that we are going to create, the Life expectancy (y-axis), income a year (x-axis) and the population (bubble size) is shown. This in steps of 10 years, for the last 50 years (1970, 1980, 1990, 20000 and 2010). So for each country 5 bubbles are shown. The location of the bubble has a meaning; for example in Japan (grey) the life expectancy is the highest and in Pakistan the lowest (green). -Have developing countries moved forward their income? -Do they have longer lifes than 10, 20, 30, 40 or 50 years ago? 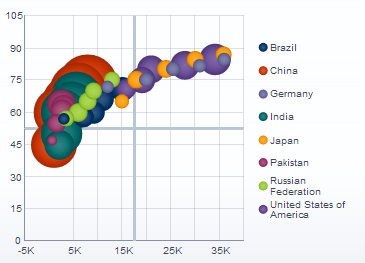 A picture says more than thousand words – you can see it immediately in the graph. A bubble graph is a type of chart that displays three dimensions of data (three series of data). The bubbles are shown on the chart at their X and Y location and the third (Z) through its size. Bubble charts can facilitate the understanding of social, economical, medical, and other (scientific) relationships. 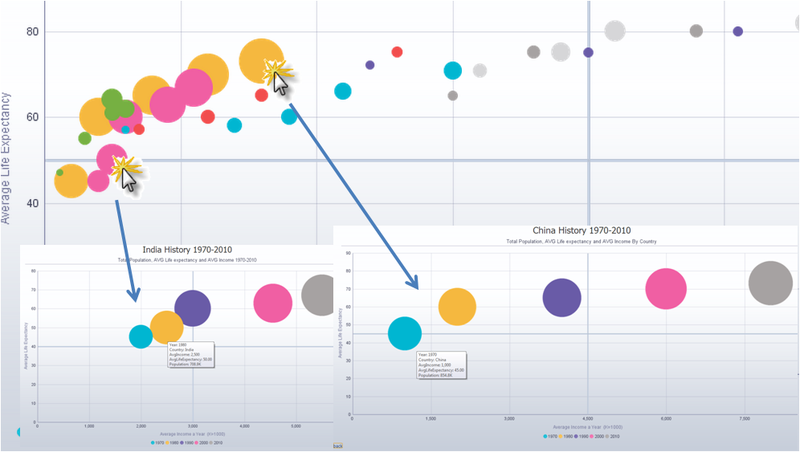 For example, Hans Rosling shows here amazing bubble charts. Use a bubble chart when you want specific values to be more visually represented in your chart by different bubble sizes. 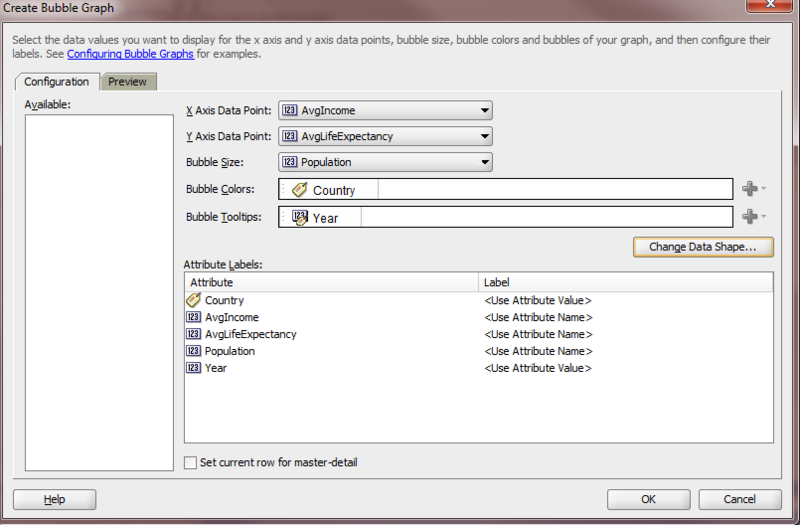 This will create the database table and the country statistics that we are going to use for the bubble graph. In the code above we execute a second usage of our ViewObject that is used for a second bubble graph – the detail bubble graph. I am struggling to find the property to remove the thick intersecting lines, which are drawn in the middle point of X and Y axis in the bubble graph. Can you please suggest me the property to remove those lines?